For years the Exceptional Software Solutions, LLC and WiSys teams have partnered together helping SMBs running Exact Macola ERp meet the business challenges of a new economy. Together the duo teams up to ensure customers are able to improve supply chain operations; from receiving through production to product delivery so they handle their warehouse needs not just for today, but as also for the future. It is a collaboration of two of the best organizations in the Exact Community. 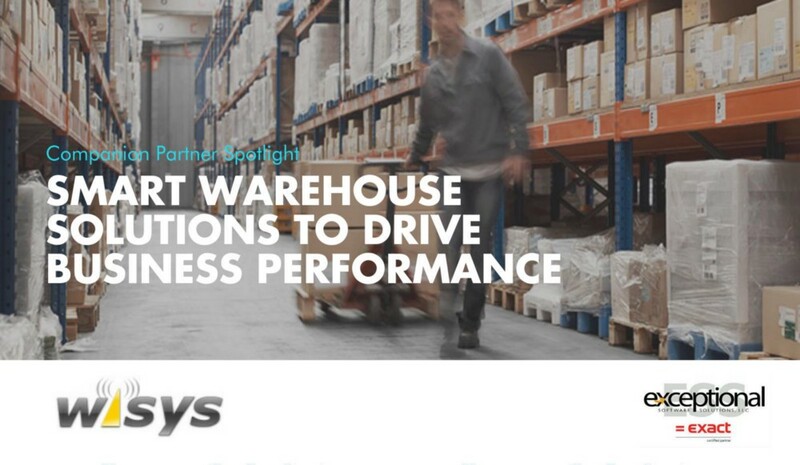 We recently sat down with Rebecca Roebuck at WiSys to learn more about their warehouse management solutions and how together with the Exceptional Software Solutions team, they provide Exact ERP customers with outstanding service, solutions, and support. Q: Rebecca, for those unfamiliar, what is WiSys and how does it integrate with Macola 10? A: WiSys is a warehouse solution and supply chain management software product that helps SMBs keep up with industry standards and compliance and enables them to get real-time data out of their Macola ERP to make better business decisions. Businesses evaluating Macola choose us because we integrate seamlessly so customers don’t need a separate system. Customers already using Macola enjoy that WiSys works with their existing system no matter which version of Macola they’re using. With WiSys, customers benefit from real-time, accurate inventory and shipping information. And that helps our customers improve supply chain interactions, lower costs, create better customer service and reduce inventory. Q: Why would this seamless integration be important? Doesn’t Macola already have that capability? A: It’s important because WiSys solves the problem of having an inventory you can’t rely on. Macola updates its software fairly frequently, and there are some niche areas, or gaps, in Macola. WiSys was founded by Bruce Hollinger, the original founder of Macola, so he could continue to work with customers on some of these niche areas. For instance, one niche was the ability to get real-time data and another was not having to manually input data into the system. When our founder created WiSys, he created a flexible and scalable solution that people can use to build solutions that better fit their processes and could grow with them as their business grew. Q: Let’s talk more about the compliance aspect of the WiSys integration. How does WiSys help SMBs achieve and maintain compliance with various industry regulations? A: Customers who come to us for help repeatedly struggle with inventory accuracy and processes. There is so much human error with manual counting, and sometimes these processes can take hours or days to complete. Things like inventory counting, recycle counting and input of orders into the system are time-consuming tasks. Using our WiSys-ESS solutions means automation to alleviate and eliminate these cumbersome, manual processes. For example, the implementation of a handheld scanner to unload inventory can be life-changing to a business. Our tools ensure that everything is scanned as it comes into the warehouse so businesses know exactly what they have, how much they have and where that inventory is located. When customers can count inventory with software, they don’t have to shut down their entire business for a day or longer to do a tedious manual count. Q. How does WiSys support legacy ERPs like Progression, ES and newer systems like Macola10? A: WiSys enables customers who are still using Progression to keep using it. WiSys effectively supercharges Progression and Macola. The data is still there, but we use WiSys tools to manipulate the data and improve processes. Basically, it takes things to the next level without the need for an upgrade. And when they do choose to upgrade, WiSys is a seamless integration of Progression into ES or older versions of Macola into Macola 10. Q: Our teams work across the U.S. and Canada. How does the community collaborate with one another? A: Our customers do learn from each other and love hearing from one another no matter where they’re located. It is very valuable for these businesses to share information across industries — things like how they meet compliance regulations and how they work through different processes. They enjoy hearing each other’s success stories and are interested to learn about the tools companies are using to work through different problems. Q: Tell us a little about some unique features of Macola 10 that WiSys customers can take advantage of? A: Our Agility learning lab for our Agility design studio products is a notable feature, and the opportunities are limitless. It’s business intelligence presentation software to create transaction components that go back into Macola. It’s used to better manage Macola information. The design studio allows customers to build their unique tools to manage whatever processes they are using. Examples include getting new orders in or exporting orders. For virtually any process, customers can make use of the design studio to build out and visualize those processes. Also, our Agility Web Explorer is brand-new. We are excited about this feature because it allows users to access WiSys from any browser or device. Q: Software adoption and utilization is always a challenge. How does our WiSys-ESS partnership facilitate this? A: You’re right, it is a struggle. We’ve taken the approach that education is key and have recently provided as much information as possible on our website. We’ve gone through all our products to make sure we have made available the necessary documentation, training and resources. We offer free online training, resources, a huge video library, and extensive online documentation. We also offer live webinars, which are great forums in which to ask questions directly of the people managing the products at WiSys. We make these available online after the live event so they are great resources too. It’s like your own trick-or-treating on our website! Q: What would you like more ERP users to understand about how WiSys works with business software consulting companies like ESS? A: I’d like customers to know that the integration with Macola is seamless and our solutions are scalable. Anyone can use WiSys to get started immediately and enjoy the benefits right away. Every business can benefit, including a small company starting with only one device. As that business grows, we scale up to multiple devices. We offer a very flexible solution that fits customers’ business processes rather than forcing customers to fit into ours. Q: So how do we bring more customers to Macola and WiSys? How do we let people know they’re a great fit? A: We have customers in numerous different industries, and many are involved in process or discrete manufacturing so they have industry regulations to comply with. These customers are a big part of our base, but we want all manufacturing customers to know about the benefits of our products. For instance, we have clients in food and beverage manufacturing and chemical manufacturing, and WiSys can create automated processes that reduce errors and reaction time. We improve supply chain interactions, lower costs, create better customer service and reduce inventory. Q: What is the one benefit customers think they’re going to get from WiSys, and what are they then surprised about actually getting? A: When people sign up for the WiSys system, they expect certain features, but our feedback has been that they get so much more than what they originally requested. Customers often didn’t think to ask for certain features, or maybe didn’t even know to ask for a particular feature, but they get them anyway — it’s great. Q: Last question. What else would you like people to know about WiSys products? A: Wow, there are lots of things WiSys does that I want people to know about! We offer great solutions for all types and sizes of businesses. We have shipping solutions and can help with manufacturing execution and pallet management. We want customers to know our full potential.